Nearly ten years have passed since Azerbaijan adopted the Latin alphabet in December 1991, following the collapse of the Soviet Union. Parliament is considering legislation to facilitate the transition to the Latin script and to strengthen the use of the Azeri language throughout society. A special Parliament committee, led by Anar, Head of the Writers' Union, has been debating these issues. One of the main concerns is to differentiate between the aspects of language usage that can be legislated and the processes that will emerge naturally in language development within the society. What restrictions would be considered an infringement of one's personal rights? Photo: Even though Azeri Latin is now the official script in Azerbaijan, many notices and signs like this one are still printed in the old Cyrillic script. Parliament is presently considering a law that would require all signs to be printed in the Latin script. Naturally, Azeri Latin is the official script for street signs, government buildings, birth and death certificates, passports, diplomas, court proceedings and other official contracts, correspondence and documents. But what about private commercial endeavors, such as store names or descriptive labeling on imported goods? What about private publications? Many members are concerned that Azeri is still not being used extensively, especially when it comes to print advertisements and billboards, store names, as well as newspapers and magazines. For instance, many newspapers have taken on foreign names such as "Express" or "Alternative". Other people are concerned that, to date, not a single newspaper publishes in the Azeri Latin alphabet. Often, the publications have headlines and titles in Azeri Latin but follow with text in Azeri Cyrillic. This situation becomes problematic in creating an informed society, as many young people can only read the headlines, while the elderly people can only read the text. 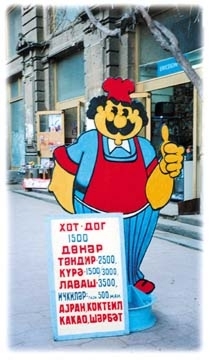 A proposed law would require that Azeri Latin be used for such documents and store signage. In regard to merchandise that might be used for commercial exchange, any additional labeling in any other language or script could not take precedence in size or position over Azeri Latin. To ensure that all university students are literate in Azeri, Parliament may rule that students who do not graduate from high school with satisfactory grades in Azeri may not be admitted to an Azerbaijani university until they pass an Azeri entrance exam. Also, fluency in Azeri would be required of all high-level government officials. Recognizing the incredible influence of television and radio in educating the public, some Parliament members have argued for establishing certification in Azeri for all announcers. The proposed law would require all reporters to meet the standards of oral Azeri, based on guidelines determined by Azerbaijan's Cabinet of Ministers. Proposed legislation may require that all national meetings and conferences take place in Azeri. Speeches made by non-Azeri speakers - including Russian - would have to be translated into Azeri. Speeches that were broadcast on television or radio would also require an Azeri voiceover. Exceptions would be allowed for religious ceremonies and observances, which could continue to follow tradition in terms of language choice. There is no official State religion in Azerbaijan, so this law would make allowances for all religions - Russian Orthodoxy, Judaism and Christianity - as well as the traditional religion of the nation, Islam. Some Parliament members recognize that initiatives undertaken in Azerbaijan will affect the development of the Azeri language elsewhere, in places where Azeris reside or have settled, including Iran (Southern Azerbaijan), Russia and Georgia. They believe that educational initiatives should encourage the opening of Azeri language schools and the elevation of Azeri instruction to international standards. Proposed legislation would honor the languages of national minorities and ethnic groups but require the use of Azeri as a means of communication on the State level. The orthographic rules of written Azeri would be established by the Cabinet of Ministers, and all would be obliged to follow them. Usage rules for the spoken language would be confirmed by the same body and, though not imposed, would be used as criteria by which to judge an individual's cultural level. Foreign companies would be expected to respect Azeri as the State Language and follow these policies in regard to its written usage in addresses, official correspondence, contracts and written appeals to the Azerbaijani government. These issues outline the major discussions that have taken place in committee meetings held during the early months of 2000. Soon these principles are expected to be introduced to Parliament, where no doubt, serious debate will continue. Editor: Surprisingly little discussion has taken place in these sessions in regard to a solution for standardizing Azeri Latin and Azeri Cyrillic font sets or for standardizing a computer keyboard layout. Both issues are critical to facilitate computer and Internet usage. It seems that many committee members are completely unaware of the problem, perhaps because they themselves do not use computers. They do not seem to realize the severe and crippling consequences of ignoring these issues in this age of technological communication. So much time has already passed since Azeri Latin was first adopted. If the problem is not addressed at a State level, confusion will only continue to proliferate and hamper other legislation that the State wishes to put into effect. We would suggest that a standardized font set and keyboard layout needs to be identified or at least recommended on the State level, so that the computer can be utilized in its full capacity throughout the Azeri-speaking community and around the world.